Tower cranes are widely used for lifting operations in the construction industry. Statistics show that tower cranes contribute to quite a number of serious accidents. Property damage and bodily injuries can be avoided if they are properly used. Tower cranes are a modern form of balance crane that consist of the same basic parts. Fixed to the ground on a concrete slab (and sometimes attached to the sides of structures as well), tower cranes often give the best combination of height and lifting capacity and are used in the construction of tall buildings. The base is then attached to the mast which gives the crane its height. Further the mast is attached to the slewing unit (gear and motor) that allows the crane to rotate. On top of the slewing unit there are three main parts which are: the long horizontal jib (working arm), shorter counter-jib, and the operators cab. The long horizontal jib is the part of the crane that carries the load. The counter-jib carries a counterweight, usually of concrete blocks, while the jib suspends the load to and from the center of the crane. The crane operator either sits in a cab at the top of the tower or controls the crane by radio remote control from the ground. In the first case the operator’s cab is most usually located at the top of the tower attached to the turntable, but can be mounted on the jib, or partway down the tower. The lifting hook is operated by the crane operator using electric motors to manipulate wire rope cables through a system of sheaves. The hook is located on the long horizontal arm to lift the load which also contains its motor. It means a device intended to be fitted to a crane that automatically gives an audible and visible warning to the operator thereof that the crane is approaching its safe working load, and that automatically gives a further audible and visible warning when the crane has exceeded its safe working load (Regulation 3(1) of the LALGR). It includes drawings, details, diagrams, calculations, structural details, structural calculations, geo technical details and geo technical calculations which are certified by safety supervision personnel. b) by reason of training and practical experience, competent to perform the duty (Regulation 3(1) of the LALGR). Frames of a climbing crane, which transfer the loading from the crane on to the structure that supports it. Vertical structural frameworks by means of which some types of climbing cranes are raised. A condition when a crane is subject to an overturning moment which cannot be increased by even a small amount without causing the crane to fall over. The maximum height at which a tower crane can operate without being held by ties or guys. Gauge The dimension between the inner faces of the rail heads of the rail track of a crane. It means climbing of a tower crane or the addition or removal of mast section to or from the main tower. An overlapping zone is the space which may be swept by the load, its attachment or any part of the tower crane, and common to at least two tower cranes. Ties used to retain rails at the correct distance apart and to withstand the imposed tensile and compression forces. The means of securing the tower within tie frames or climbing frames of a tower crane. A working space limiter is a limiting device to prevent the load, its attachment or any part of the tower crane from entering an overlapping zone. Static and mobile tower cranes are available in a wide variety of types and configurations according to the particular combination of tower, jib and type of base which they employ. Tower cranes are available with either fixed or slewing towers. On the fixed tower type the slewing ring is situated at or near the top of the tower and the jib slews about the vertical axle of the stationary tower. The slewing ring on the slewing tower type is situated at the bottom of the tower and the whole of the tower and jib assembly slew relative to the base of the crane. The towers can be further classified as being mono towers, inner and outer towers and telescopic towers. The jib is carried by a single tower structure which may be either fixed or slewing. Provision may be made in the design to permit the tower to be extended.(Figure-1) . They are characterized by the jib being carried by a fixed or slewing inner tower which is supported at the top of the fixed outer tower. Provision may be made in the design to permit the outer tower to be extended.(Figure-2) . The tower structure consists of two or more main sections which nest into each other to enable the height of the crane to be altered without the need for partial dismantling and re-erection. Telescopic towers are usually of slewing type and more common on rail-mounted and mobile tower cranes.(Figure-3) . The main types of jib used on tower cranes are horizontal trolley jibs, luffing jibs, fixed-radius jibs, rear-pivoted luffing jibs and articulated jibs. They are held in a horizontal or slightly raised position by tie bars or ropes connected to an “A” frame on the top of the tower crane. The hook is suspended from a trolley which moves along the jib to alter the hook radius. A suitable allowance needs to be made for deflection when calculating the clearance between adjacent cranes. They are connected directly to the tower top and do not require tie bars or ropes connected to an “A” frame. This reduces the overall height of the crane. The hook is suspended from a trolley which moves along the jib to alter the working radius. A suitable allowance needs to be made for deflection when calculating the clearance between adjacent cranes. They are pivoted at the jib foot and are supported by luffing cables. The hoist rope which supports the load usually passes over a sheave at the jib head, and the hook radius is altered by changing the angle of inclination of the jib. They are also mounted on pivots at the jib foot. Unlike the luffing jibs, these are held by jib-ties at a fixed angle of inclination. On some types, the hook is suspended from the jib head and the hook radius cannot be altered, whereas on others the hook is suspended from a saddle or trolley which travels on the jib. The jib pivot of this type of jib is situated at the top and behind the center line of the tower and the hook is supported by the hoist rope which passes over a sheave at the jib head. The jib has a pivot point somewhere in its middle area. Some models are level-luffing; that is, the hook elevation remains constant as radius changes. It is possible to provide either a trolley or a fixed-location hook or even a concrete pump-discharge line. Articulated jibs are mounted on towers identical to those used with horizontal trolley jibs. 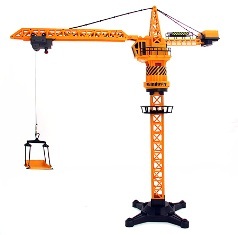 Tower cranes are also characterized according to their mounting configuration. They are available as static bases, rail-mounted units and mobile units. There are three main types of static bases. The crane is mounted on special corner angles,frames or an expendable tower section, cast into the concrete foundation block. On own base – The crane is mounted on its own base section or chassis which, without wheels and traveling gear, but with ballast, stands on a concrete base. Climbing base – The crane is supported by the structure which it is being used to construct, and to which it is attached by climbing frames and wedges. The height of the cranes can be extended as the height of the structure increases by means of climbing supports attached to the frames. Climbing support can be metal ladders, rods or tubes. A climbing crane may be mounted initially on a fixed base and its support be later transferred to climbing frames and supports. The cranes are mounted on a chassis frame which is supported on rail wheels. The wheels are usually double flange. When all wheels are removed, some tower cranes can be used as static based cranes . The mobile mounting configuration consists of truck mounted, wheel-mounted / crawler mounted units. 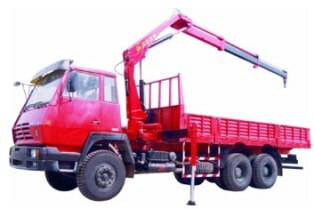 Tower cranes mounted on truck or lorry chassis are available. It is essential that this type of crane has its outriggers extended. The outriggers should be securely set up and level on its jacks when handling loads. These are not normally self propelling and may be moved by towing by a suitable vehicle. They are provided with stabilizers or outriggers and jacks which should be set (and the wheels either removed or raised clear of the supporting surfaces) before commencing erection or lifting operations. There are two principal types of crawler bases used on this type of tower cranes. One is a twin track type which is mounted on one pair of crawler tracks. The crane requires outriggers to be extended and jacks set when handling loads. The other is the straddle-type which is mounted on four widely spaced crawler tracks, each of which can be adjusted to height. Both types of tower cranes should be set firm and level when handling their rated safe working loads. In general, they do not have the same freedom of mobility as for example crawler-mounted mobile cranes.Reference should be made to the crane specification and to the manufacturer regarding conditions under which these machines may travel in their erected state. The crane should have a permanent durable plate bearing the manufacturer’s name, machine model, serial number, year of manufacture and weight of the unit for identification purpose. Every major structural, electrical and mechanical component of the machine should have a permanent durable plate / a clear indication bearing the manufacturers’ name,machine model number, serial number, year of original sale by the manufacturer and weight of the unit. Besides, identification numbers should be clearly marked on all basic removable components and attachments of the machine (such as counterweights etc.) to show that they belong to that machine. It is important that these components should be used only on that machine or identical models or equipment for which they were specifically intended by the manufacturer. All types of crane, except those with a maximum safe working load of 1 tonne or less or those operate with a grab or by electromagnetic means, shall be fitted with an automatic safe load indicator (Regulation 7B of the LALGR). The automatic safe load indicator is usually used in association with overloading cutout devices. The specification of automatic safe load indicator should conform to British Standard 7262 or equivalent standards. All controls must be located within easy reach of the operator and allow him ample room for operation. The controls should be of dead man switches in that they return to neutral automatically when released. The main power switch should be lockable and located within easy reach of the operator. Each control must be clearly labelled and marked to show the motion and the direction of movement that it controls. 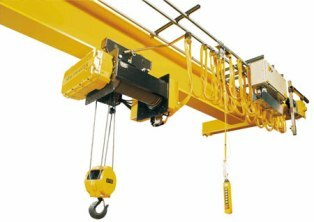 Where practicable, controls should be arranged so that accidental displacement is prevented and inadvertent pressure on them does not cause the crane to be set into motion. travel limit switches for rail mounted cranes that apply the carriage brake whenever the crane comes near the ends of the tracks. (a)The ground or foundations, temporary supporting structures, grill ages, packing’s, connections and anchorages for tower cranes should be of sufficient strength to withstand the maximum in-service and out-of-service loading without failure. In particular, suitable preparation of ground surface for fixed tower cranes should be carried out for safety reason. (b) It is essential that the ground on which a tower crane stands has adequate bearing capacity. In assessing this, account should be taken of seasonal variations in ground conditions. The bearing capacity must not be exceeded under the most severe static and dynamic crane loading conditions. (c) The siting of the crane, the assessment of maximum loads and the design of foundations, supporting structures and ancillary details should be certified by a safety supervision personnel. Particular care should be taken to ensure that the imposed loading’s are not underestimated. Careful assessment of probable wind pressures should also be made, taking into account the degree of exposure of the site and any other special factors. (d) Although tower crane manufacturer’s instructions may specify maximum wind speed for service conditions, they cannot give recommendations for survival wind conditions on a particular site. On tall cranes, wind forces will have a considerable influence on the strength requirements of the supports and foundation. (e) Cranes should not be sited where there is danger to their foundations, supporting structures from cellar whether filled or not, temporary shoring, excavations, embankments, buried pipes and mains, and etc. With these underground hazards, it may be necessary to provide additional special foundations to ensure the safety of the crane. (f) In areas subject to tidal or seasonal flooding, or where there is a high water table, the crane may require deep foundations or special ground consolidation. In such situations, all machinery and electrical equipment should be positioned where it is not in danger from any rise in the water level. Unless adequate precautions are taken, the crane should not be sited where there is danger to foundations, rail tracks or temporary access roads from surface water drainage, flooding or rises in the water level. provision of adequate lighting between floors; and ensure the work is carried out by competent workmen and competent person. When the base or chassis has been set up, the tower (which may include the slewing gear and tower head) is then erected and attached to it using a second crane or a self-erection procedure. In either case the tower should be correctly orientated within the base section. Where the jib is attached to the tower head before the tower is raised from horizontal to the vertical position, some means, such as a plank or board should be placed beneath the outer end of the jib to ensure that it can move freely across the ground as the tower is raised. Where a second crane is used for erection, the number of sections in any tower sub-assembly should be minimum as to eliminate excessive stresses in the assembly when it is raised from the horizontal to the vertical position. It is recommended that jib-ties are attached before the jib is raised and positioned at the top of the tower section. When a tower section or sub-assembly has been placed in position, all bracing, locking devices, etc., should be attached and bolts securely tightened before proceeding with the next stage of the erection operation. It is essential to ensure that any specially strengthened tower sections are positioned where required. It may be necessary to guy or support the tower depending on its free standing height. When tension the guys, ensure that the pull is even on each and that the tower remains perfectly plumb. Ensure also that blocking is installed in the tower to support the guys and to prevent the tower from being damaged. Cranes shall not be used under weather conditions likely to endanger its stability. Before a crane is taken into use after exposure to weather conditions likely to have affected the stability of the crane, the crane’s anchorage or ballast shall be tested by a competent examiner (Regulation 7G of the LALGR). Any instructions issued by the crane manufacturers advising conditions under which a crane should be taken out of service and recommending the conditions in which it should be placed should be strictly followed. During adverse weather conditions such as rainstorm and lightning, adequate precautions should be taken to prevent personnel associated with the use of the crane from being endangered. Cranes are generally designed to operate in conditions of normal steady wind speed and should not be operated in wind speeds that are in excess of those specified in the operating instructions for the crane. Gusty wind conditions may have an adverse effect on safe working loads and machine stability. Even in relatively light wind conditions it is prudent to avoid handling loads presenting large wind-catching surfaces. Name boards or other items presenting a wind catching area should not be fitted to the jib, counter jib, or tower of a tower crane without the express approval of the manufacturer. An anemometer or wind speed measuring device should be provided at a suitably elevated position on all tower cranes. Where practicable the indicator of the instrument should be fitted at the crane operator’s station. Necessary actions on the operation of tower cranes which correspond to various magnitudes of measured wind speed as recommended by the manufacturers should be strictly adhered to. (1) Further to weekly full inspection by competent person, inspection and maintenance to tower crane(s) should be carried out at least once in a month by the inspection and maintenance technicians for tower crane. (2) The inspection and maintenance technicians should properly record all their work performed and the respective findings. (3) The record should be read and signed by inspection and maintenance technician(s). inspection of the lubrication, wear and tear condition of wire ropes; and boom stops. h) check the security of the counterweight or ballast where this is in the form of removable weights, check that the weights fitted correctly correspond to those shown on the counterweight chart for the operating condition. A crane is a tower or derrick that is equipped with cables and pulleys that are used to lift and lower material. They are commonly used in the construction industry and in the manufacturing of heavy equipment. Cranes for construction are normally temporary structures, either fixed to the ground or mounted on a purpose built vehicle. They can either be controlled from an operator in a cab that travels along with the crane, by a push button pendant control station, or by radio type controls. The crane operator is ultimately responsible for the safety of the crews and the crane. The most basic type of crane consists of a steel truss or telescopic boom mounted on a mobile platform, which could be a rail, wheeled, or even on a cat truck. The boom is hinged at the bottom and can be either raised or lowered by cables or hydraulic cylinders. 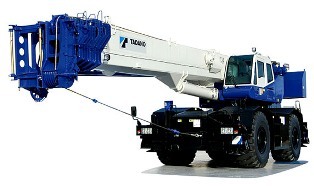 This type of crane offers a boom that consists of a number of tubes fitted one inside of the other. A hydraulic mechanism extends or retracts the tubes to increase or decrease the length of the boom. The tower crane is a modern form of a balance crane. When fixed to the ground, tower cranes will often give the best combination of height and lifting capacity and are also used when constructing tall buildings. Cranes mounted on a rubber tire truck will provide great mobility. Outriggers that extend vertically or horizontally are used to level and stabilize the crane during hoisting. A crane that is mounted on an undercarriage with four rubber tires, designed for operations off road. The outriggers extend vertically and horizontally to level and stabilize the crane when hoisting. These types of cranes are single engine machines where the same engine is used for powering the undercarriage as it is for powering the crane. 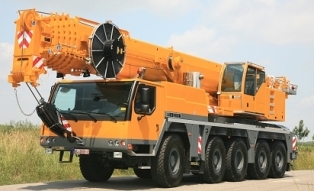 In these types of cranes, the engine is normally mounted in the undercarriage rather than in the upper portion. A loader crane is a hydraulically powered articulated arm fitted to a trailer, used to load equipment onto a trailer. The numerous sections can be folded into a small space when the crane isn’t in use. Also referred to as a suspended crane, this type is normally used in a factory, with some of them being able to lift very heavy loads. The hoist is set on a trolley which will move in one direction along one or two beams, which move at angles to that direction along elevated or ground level tracks, often mounted along the side of an assembly area. In the excavation world, cranes are used to move equipment or machinery. Cranes can quickly and easily move machinery into trenches or down steep hills, or even pipe. There are many types of cranes available, serving everything from excavation to road work. Cranes are also beneficial to building bridges or construction. For many years, cranes have proven to be an asset to the industry of construction and excavating. Crane operators make really good money, no matter what type of crane they are operating. The will establish crane safety operational procedures through the use of this document. This standard practice instruction applies to cranes used in conjunction with other material handling equipment for the movement of material. The types of cranes covered. Training shall be conducted prior to job assignment. This employer shall provide training to ensure that the purpose, function, and proper use of cranes is understood by employees and that the knowledge and skills required for the safe application, and usage is acquired by employees. This standard practice instruction shall be provided to, and read by all employees receiving training. 1 Pre operational inspection requirements of the crane to be used. 2 Specific operational requirements of the crane to be used. 3 Principals of crane operations. 4 Recognition of applicable hazards associated with the work to be completed. 5 Load determination and balancing requirements. 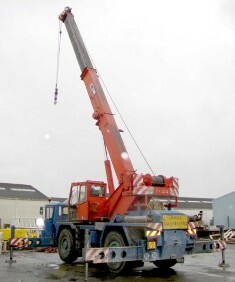 6 Procedures for removal of a crane from service. 7 All other employees whose work operations are or may be in an area where cranes may be utilized, shall be instructed to an awareness level concerning hazards associated with cranes. Physical and mental requirements of operators. Crane operators will be screened for physical and mental impairments that could result in a improper use. Operators will meet as a minimum, the following requirements before being certified to operate cranes. Be drug and alcohol free during any lifting event. Be thoroughly trained in all facets of the required lift. Have a mature and safe attitude at all times. Have good depth perception (essential for load spotting). Have good hearing and vision (corrected or uncorrected). Have no history of unsafe acts in the workplace. Have the ability to react quickly in an emergency. Take no medication that will interfere with the operation. Understand the requirements for all phases of the lift. Certification. This employer shall certify that employee training has been accomplished and is being kept up to date. The certification shall contain each employee’s name and dates of training. 1. Always check warning devices and signals before use. 2. Always document and maintain inspection records. 3. Always ensure cranes shall not be loaded in excess of their rated capacities. 4. Always ensure the new location support the weight? 5. Always keep employees clear of loads about to be lifted and suspended loads. 6. Always keep suspended loads clear of all obstructions. 7. Always lockout before maintenance or repairing cranes. 8. Always position the hook directly over the load before lifting. 9. Always test brakes by a short lift to ensure control. 10. Before being lifted, loads will be checked for proper balance. 11. Follow the manufacturer’s recommendations. 12. Frequently inspect cranes exposed to adverse conditions. 13. Hands must not be placed between the suspension means and the load during lifting. 14. Know where you’re going to set the load down! 15. Know your travel path in advance of the lift! 16. Loads will in all cases be properly balanced to prevent slippage. 17. Move loads only after being signaled by the designated, qualified signaler. 18. Never allow riders on loads or hooks. 19. Never allow unauthorized persons to operate cranes. 20. Never attempt to operate a crane or hoist that is suspected to be unsafe. 21. Never carry loads over workers. 22. Never carry loads past workers (they must yield right of way). 23. Never use a cranes that are damaged or defective in any way. 24. Operators must watch the signalers. 25. Shock loading is prohibited. 26. Signalers must keep line of sight with the operator. 27. Signalers must watch the load. 28. Test all hoist controls and brakes at the beginning of each shift. 1. Ensure that only one person is the designated signaler. 2. Ensure the operator acknowledges every signal. 3. Follow the manufacturer’s recommendations. 4. Know the new location will support the weight. 5. Maintain line of sight with the operator. 6. Operators must watch the signalers. 7. Plan in advance where the load is going! 8. Stop the operation any time comprehension is lost. Make a visual check for any dangerous condition. Place all controls in the “off” position. Place main power switch in the “off” position. Raise all hooks to but not through limit switches. Report all cranes that are not in operation immediately. Tag out defective equipment immediately. 1. Always keep hands and fingers clear of untensioned loads. 2. Always keep suspended loads clear of all obstructions. 3. Always keep suspended loads clear of employees. 4. Always pad or protect slings from sharp edges of the load. 5. Always think before you affect a load. 6. Determine the history of the care and usage of the sling. 7. Determine the number of sling legs (if used) and load requirements. 8. Ensure you know rated capacity of the sling. 9. Ensure you know the angle the sling makes with the horizontal line. 10. Ensure you know the size, weight, and center of gravity of the load. 12. Never load in excess of the rated capacity. 13. Never pull a sling from a suspended load under tension. 14. Never shorten with knots, bolts or other makeshift devices. 15. Never use a sling that is damaged in any way. Lifting will not be conducted until load weights have determined. When estimating load weights operators will stay within 50% of the cranes rated capacity when estimating loads (or manufacturer recommendation). Never attempt a load lift based solely on a guess! The following methods may be used to estimate the weight of loads. Consult with the equipment manufacturer. Estimate weight using weights of similar loads. Use industry standard tables or charts. Ensure PPE is appropriate for the particular hazard(s). Ensure PPE is kept clean, fully functional, and sanitary. Maintained all PPE in good condition.. Properly store PPE when not in use. Cranes will be inspected each day before being used, the crane will inspected in accordance with OSHA, Consensus Standards, and Manufacturer recommendations. Supervisors will determine and schedule additional inspections periodically during crane use, where service conditions warrant. A thorough periodic inspection shall be made on a regular basis, to be determined on the basis of, frequency of crane use; severity of service conditions; nature of lifts being made; experience gained on the service life of cranes used in similar circumstances, & OSHA, Consensus Standards, and Manufacturer recommendations. Cranes inspections will be documented as having been inspected. Scheduled inspections will be documented as having been conducted. 1. Identify items that were inspected. 2. Show the status of the inspected items. 3. Provide the signature of the inspector. 5. File it and maintain it! 6. Review the manufacturers specific inspection requirements! 1. Check for air or hydraulic fluid leakage. 2. Check for load capacity stenciling on both sides of unit. 3. Check for twisted, broken or kinked cables or chains. 4. Check the operation of the crane; controls & movement. 5. Inspect for deformed, cracked, or stretched hooks. 6. Inspect for serviceable safety latches. 7. Observe correct drum spooling as the hook is raised. 8. Operate empty hook till it actuates the upper limit switch. 9. Operate hoist and trolley brakes, ensure no excessive coasting. 10. Visually inspect all units for integrity, leaks etc. 11. Review the manufacturers specific requirements! 1. Follow any additional recommendations of the manufacturer. 2. Inspect for twisted, broken or kinked cables or chains. 3. Inspect hooks for cracks, missing or broken parts. 4. Measure hooks for deformation or stretching. 5. Measure lifting chains for excessive stretch, twisting etc. 7. Visually inspect all critical items. 8. Review the manufacturers specific requirements! 1. Interval dependent on the type of activity performed. 2. Interval dependent on the severity of service. 3. Interval dependent on the environmental conditions. Note: Different conditions may suggest different intervals. The use status of cranes will drive specific requirements for periodic maintenance and servicing. The status of the crane will be determined based on manufacturer recommendations and consultation with specific regulatory standards. Prior to initial or reintroduction into service cranes will be tested and inspected completely using the criteria applicable to periodic inspections. A report will be generated and kept on file for future reference. The manufacturers specific requirements will be reviewed! 2. Adjusting the operation of limit switches. 3. Checking and filling the gear cases to the proper levels. 4. Cleaning and lubricating the wire rope (cable) and load chain. 5. Cleaning or replacing pitted or burned electrical contacts. 6. Cleaning or replacing the air and fluid filters. 7. Inspecting the operation of all controls and warning systems. 8. Lubricating the bearings, gears, pinions, linkages, shafts, etc. 9. Replacing any contaminated oils. Check for obstructions in the travel path of the crane. Check upper and lower limit switches. Ensure all emergency disconnects are known before any test. Ensure that the manufacturers recommendations are followed. If you have a checklist follow it! If you’re not familiar with the cranes’ operation get help. Inspect all electrical controls for proper operation. Never unwind the spool completely! Observe for smooth operation of the components. Test all controls to determine proper operation. 1. Replace if deformation or cracks are found. 2. Check for proper function of the safety latch. 3. Inspect for twists from the plane of the unbent hook. 4. Check for proper swivel. 5. Hook repair is generally not recommended. 6. Emergency hook repair must be performed only under competent supervision. 7. After any hook repairs, the hook must be load tested before being returned to normal service. Broken or worn outside wires. Corroded or broken wires at end of connections. Reduction in rope diameter (replace if found). Severe kinking, crushing, cutting or unstrapping. 1. Review requirements for the individual crane. 2. Integrate lock out and maintenance requirements. 3. Ensure training in adequate for level of maintenance. 4. Ensure written programs are established and reviewed. 5. Carefully select lockout devices, ask the manufacturer for recommendations. 6. Do not necessarily assume devices are interchangeable between different types of cranes.